Tags can be used to sort contacts into specific lists, so you can send the most relevant information to the right people. 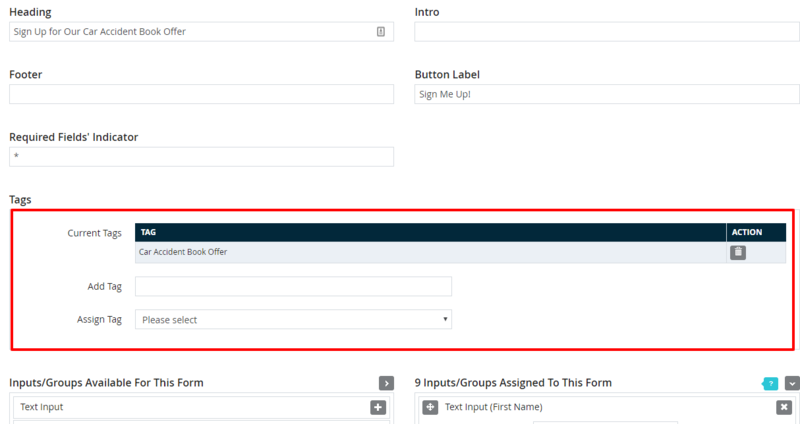 Adding tags to forms and campaigns will help to automate the process, and allow users to self-select into the appropriate marketing groups. 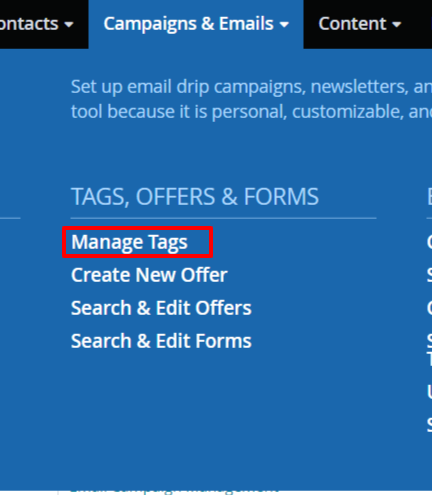 To begin, click the top dropdown navigation bar under Campaigns and Emails to manage your existing tags. You can see a list of tags and the number of contacts who have that tag in their contact record. You also have the ability to create tags within individual contact records manually. Contacts in DSS can be given a tag manually, or the process can be automated by adding a tag to a form (explained below). To manually add tags, search for the contact record under Contacts>Search & Edit, then select from a list of available tags in the “Assign Tag” dropdown menu, or create a new tag in the “Add Tag” field. Important Note: If the tag is assigned to a campaign with a drip email sequence, the contact will begin to receive the emails from that campaign. Forms can be assigned a tag that will automatically tag all contacts who complete that form. This makes it easy to send leads only the information that is relevant to them. For example, if a user fills out a form for more information on car accident cases, you can add a tag to send them information about car accidents, rather than emails about your other practice areas. More targeted marketing leads to better results! Campaigns can be assigned a tag. Assigning a tag to a campaign will send the email drip sequence to any contact record who shares the same tag. Those contacts get tagged either by filling out a form on the website or by manually tagging a contact. Be mindful that any contact record with a tag assigned to a campaign will start receiving that campaign, so it’s a good idea to use campaign-specific tags, rather than general tags. You can learn more about using tags to send emails to specific groups, and how to include or exclude groups from email communications here. Need help setting up or managing your tags? Give us a call at 888-886-0939, and we’ll be happy to help you out!